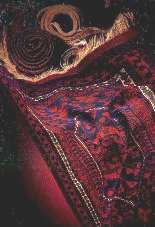 Although no one knows presicely when and where the technique of weaving first started, There is no doubt that the weaving art, in general, started in Central Asia. A popular explosion coused the inhabitants of that area to migrate to the western parts of Asia in order to find more presperous land. These migrating tribes were caled yoruks or nomadic tribes. During their migrations, these nomads, who were exposed to severe weather conditions, learned to use goat hair in the making of their tents. Goat hair is longer and much siffer than sheep's wool. 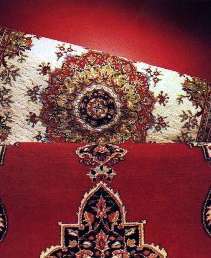 The flatweave technique was used in the making of nomadic tents. Just as with a little girl's braided pony-tail where strants of the shorter and stiffer hair stick out, the goat hair sticks out of the woven fabric, gets wet, drops and partially cover the holes in the flatweave, thus making tent almost waterproof. Later on, these nomadic people felt the need to isolate themselves from the humidity present in the earthen foolrs of their tents. 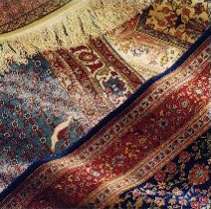 They then applied the very same techniques of flatweave to the making of of floor coverings and called them "Kilims". Since this was the area of paganism, most flatweave designs reflected stylised depictions of the worshipped sembols. Over a period of time, the art of weaving improved and many items usefull in every day life were woeven-for example saddle bags for horses and camels that could be used in the transportation of many types of items. The Yoruks also wove kilims with goat hair and used them as warm blankets since the fibers were so long-just as in today's Siirt blankets. It's thought that these early blanket were woven in imitation of actual animal felts. Kilims were also woven as room dividers in the tents, as well as for cradles, with the corners tied to the overhead tent poles so that the cradle could be swung back and forth to rock the babies to sleep. These many types of woven products improved over time with additional uses developed on an evolutionary basis. At first the nomads, who strictly lived in tents, stacked dried leaves and lay them in the corners of their tents and used the soft stacks as beds. Under the weight of the sleepers, the beds rapidly turned into dust and provided little comfort, thus causing frequent replacement. Then in a further inspiration of using animal pelts as a model, the nomads started to add pile to the basic flatweaves. These first pile rugs were very supple, the nomads would simply fold and throw them on a horse's back to be used as a sleeping bag during their long voyages. As we mentioned before, no one knows exactly when and where the first knotted-pile carpets were woven; however the oldest "surviving" pile carpets was descovered in the grave of a Sycthian price in the Pazyryk valley of the Altai mountains. In Siberia by Russian archeologist (Rudenko) in 1947 and is presently displayed in the Hermitage Museum in Leningrad. 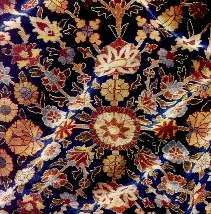 The carpet was woven with the Turkish double knot and contains a surprising 347.000 knots per suquare meter (255 per square inch); it is 3.62 square meters (6 x 6.5 feet) and has been carbon dated to have been from the 5th. century B.C. It was loaded and subsequently flooded and froze to a wait discovery by Rudenko. The Pazyryk, or Altai carpet, is rather sophisticated, thereby showing that it is the product of a long history and tradition of weaving.